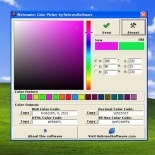 Webmaster Color Picker 2.1 - Use this Photoshop-like color picker to help choose colors for your websites, programs or office applications. Displays Decimal, RGB, VB and HTML color codes for each selected color. Отзывов о программе Webmaster Color Picker 2.1 пока нет!